The American Red Cross supplies about 40 percent of the nation’s blood supply. The Red Cross provides blood for patients in approximately 2,700 hospitals across the U.S. Blood comes into the center through triage. 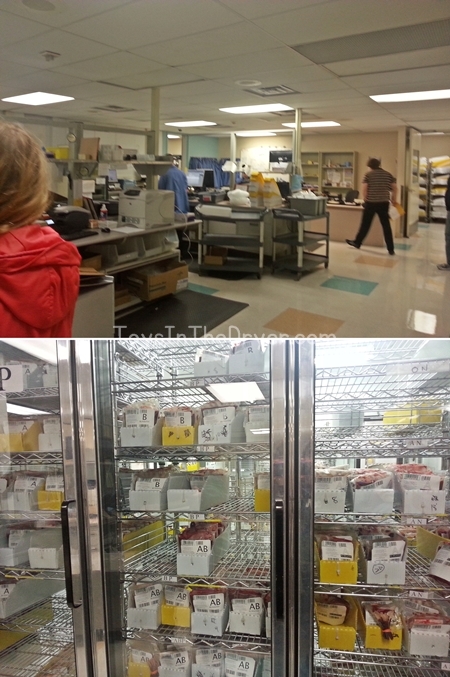 Here donations are inventoried and sorted by component (cryo, plasma, whole blood, double red cells, platelets…). Those components with a shorter life span are processed first. The blood center has to inventory and keep track of EVERYTHING that comes in and goes out including their waste and blood that is not acceptable for donation. Blood and blood components are checked and double checked through each step. Eighty percent of the blood donations given to the Red Cross are collected at mobile blood drives set up at community organizations, companies, high schools, colleges, places of worship or military installations. 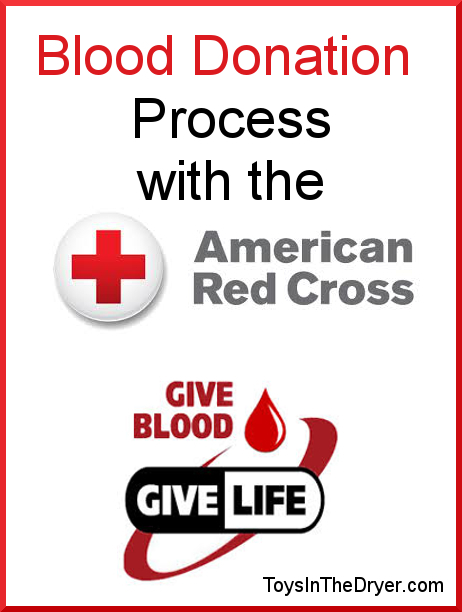 The remaining 20 percent are collected at fixed Red Cross donor centers. From triage, whole blood is filtered to remove white blood cells. 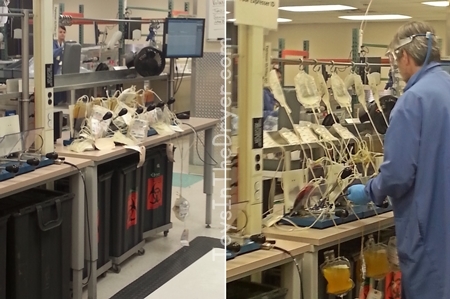 This is one way to prevent blood transfusion reactions. White blood cells are bigger than red blood cells so they are trapped in the filter as the blood flows from one bag to the other. The filtered blood is stored in a cooler until the next step. There are four types of transfusable products that can be derived from blood: red cells, platelets, plasma and cryoprecipitate. Typically, two or three of these are produced from a pint of donated whole blood – hence each donation can help save up to three lives. Next it’s on to the centrifuge for the blood. In this machine the blood is spun at high speeds and is separated into red blood cells and plasma. The heavier red blood cells sink to the bottom of the bag while the plasma stays on top. Most donated red blood cells must be used within 42 days of collection. Donated platelets must be used within five days of collection – new donations are constantly needed. Plasma and cryoprecipitate are stored in frozen state and can be used for up to one year after collection. Once separated into red blood cells and plasma, this super simple yet awesome machine squeezes the bags so that the plasma goes into a separate bag. A preservative is also added to the red blood cells to make their shelf life a little longer. Plasma is frozen. A healthy donor may donate red blood cells every 56 days, or double red cells every 112 days. A healthy donor may donate platelets as few as 7 days apart, but a maximum of 24 times a year. Red blood cells are now ready to be labeled by ABO(H) type. H meaning negative or positive. Type O-negative blood (red cells) can be transfused to patients of all blood types. It is always in great demand and often in short supply. Type AB-positive plasma can be transfused to patients of all other blood types. AB plasma is also usually in short supply. Whoot, whoot! 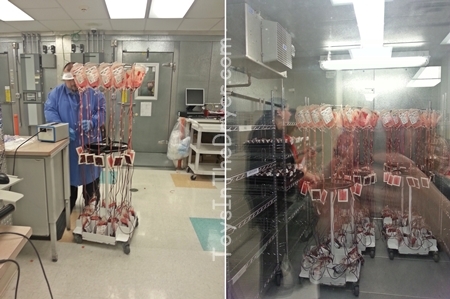 Your red blood cells are now at the blood bank waiting to be sent to hospitals across the US! All donated blood is tested for HIV, hepatitis B and C, syphilis and other infectious diseases before it can be released to hospitals. Of course, somewhere along the line all blood and components are tested for “quality control” to make sure that they are safe for recipients. 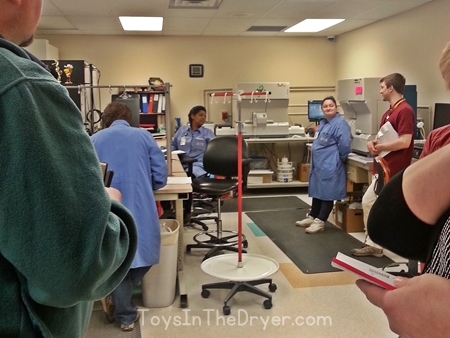 Through each step, blood and components are tracked and inventoried. 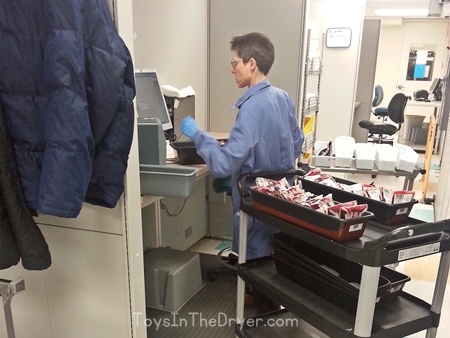 Every person who touches that unit of blood or component is tracked too. 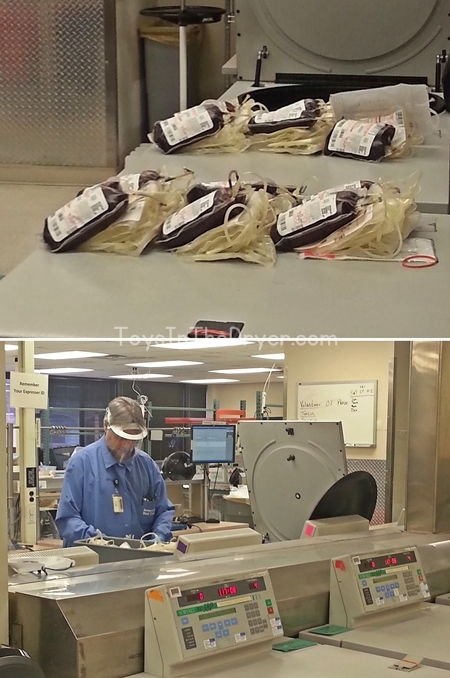 I was amazed at how much safety measures go into blood processing! This post has been a very simplified version of what happens to your blood after you donate it. A WHOLE lot more goes into the process (especially with individual blood components) but that’s just WAY too much to talk about. Here’s the Red Cross’s simplified version. I hope you’ve enjoyed seeing what goes into this life saving donation process! Wow! What an interesting process. How long do you think these will take? 2 or 4 days atop? I want to donate but am so afraid I will pass out. I asked but our tour guide wasn’t quite sure. I doubt it’s more than two days though because they want the blood to have the longest “shelf life” possible. I am sure this will help a lot of people who weren’t sure what exactly happens when you give blood. I have a rare blood type, so I give a few times a year. This is very cool on how the real process works. My dad has donated blood for years. 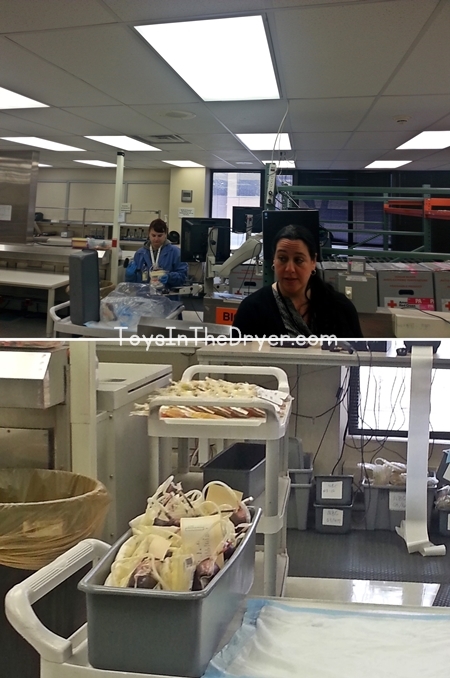 Really interesting to learn what goes on behind the scenes! We try to give blood anytime we can! It’s really interesting to learn about this whole process! I give blood but had never really thought about what happens after I leave! There is so much more to it than I ever realized. It’s so interesting to read about! That is a lot of blood! I’m not squeamish around blood, but I don’t know if I could do what those professionals do. This is so fascinating. I never thought of what happens next. Thanks for the great tour summary, J. It was such an interesting and intricate process!